A ship named ‘Hood’ can’t catch a break in the 22nd century either…..
Star Trek is a future which includes no circuit breakers and controls routinely explode in people’s faces. 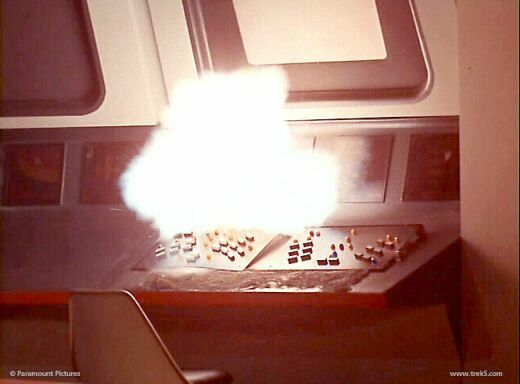 When that nacelle went, half the bridge consoles probably blew up! 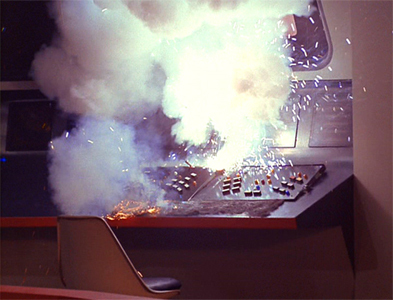 It may have been few and far between, but the TOS consoles were just as explosive as the movies, TNG and beyond. Case in point: “Where No Man Has Gone Before”. Whilst I can accept that this device the pirates have picked up is supposed to be a superweapon of some description, I’m not really sure why merely losing a bussard collector and taking minor damage to the saucer section would leave the Hood utterly crippled, without weapons, tractor beams or transporters of any kind (to the point where her other warp nacelle shuts down, even! ), especially considering how much of a battering the Constellation took in “The Doomsday Machine” while still being flyable, and the Lexington being scarcely affected at all (aside from some impulse engine damage) by a direct hit to her engineering section with full phasers with her shields down in “The Ultimate Computer”. Remember that the Constellation needed several hours of work to get her operational after her fight. But what I would be most interested in is the crew’s response to a hit from an unknown weapon. What does shattering a bussard (and probably more damage deeper in the engine from the explosion or the beam itself) do? Does Barrett have time to react to what’s in front of her or is she scrambling to keep her ship afloat? Is power shutting down ship wide a direct effect of the damage or a reaction to the damage? In TWOK the Enterprise has no time to fire back at Khan in their first encounter. When the Excelsior is hit in TUC people are too busy running away from venting gasses to do much of anything. The Hood was crippled during the minute it took the pirates to get away with no chance of being followed due to one engine being wrecked. That sounds reasonable to me. 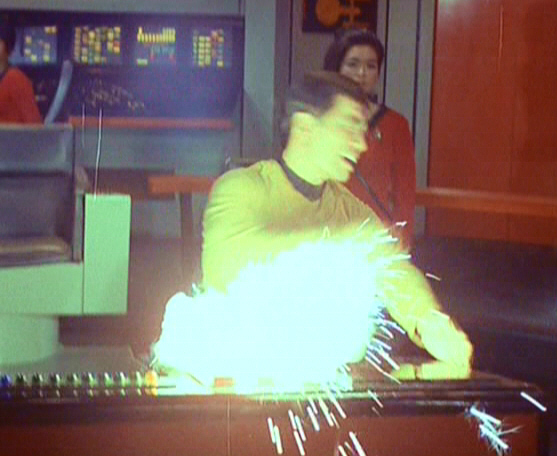 Remember also that a nick to the engine in “Cause and Effect” destroys the Enterprise twenty times in a row. So at least this is not that. Fair enough, I guess (although I’d argue that super-vulnerable warp nacelles were fairly unique to the Galaxy class, from what we’ve seen), but I have to ask, what venting gasses? Aside from knocking the crew over in typical Star Trek fashion, the Excelsior didn’t suffer appreciable damage from the one torpedo that struck her, and if you look closely you can see how her shields quite prominently absorb the damage. They didn’t return fire on Kang’s ship because their sensors couldn’t pick it up any better than the Enterprise-A’s could. Now, the editing admittedly makes it a little confusing, but I’m 99% certain that the next interior shot we see, with crewmen running around the engineering section amid smoke and sirens and shutting blast doors, is supposed to be taking place aboard the Enterprise, not the Excelsior, which fits with the fact that the interior shot we see right before the Excelsior shows up is of the Enterprise’s engineering section starting to fill with smoke and everybody panicking while Scotty reports on the Enterprise’s weakening shields. Looking at trekcore it had been several scenes since the E-A’s engine room was gassed, including the arrival of the Excelsior, Chang’s desicion to fire on it, the hit, the Excelsior bridge flipping, the E-A’s bridge reacting, and then the cadet running down the hall from the explosions followed by Chang’s revelry over hitting the Excelsior. No where else is there hit to the E-A that could possibly correspond to the mayhem in the hallway. That’s the Excelsior. Except that at the end of the ‘mayhem in the corridor’ scene, the blast door comes down and we see a warp core quite clearly reflected in it. I find it unlikely that Enterprise and Excelsior both just so happened to suffer white gas-spewing damage to their engine rooms, but that’s just me, I guess. Keep up the good work. I am loving this series.